In rare instance of unity, people eye government’s blunders, not each other. 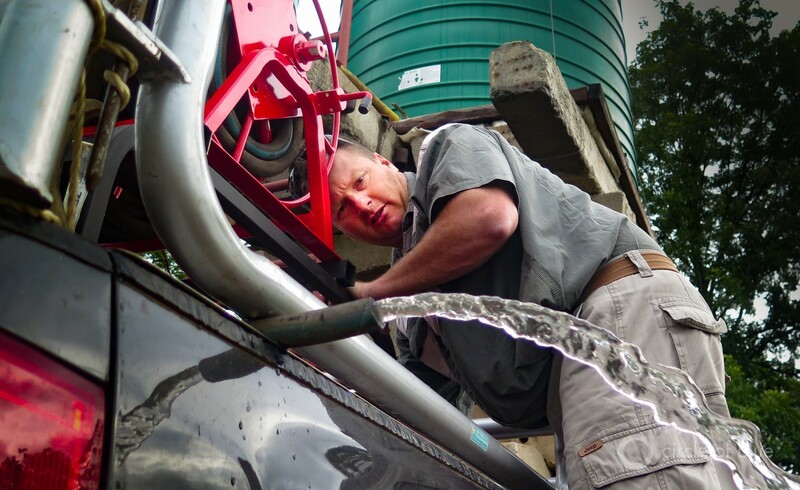 Karsten Hinze fills a 500-liter tank from spring-fed water tanks at his brother’s farm for delivery to the homes of his mother and sister in Paulpietersburg, South Africa. He makes the trip every two weeks or so. PAULPIETERSBURG, South Africa — One test of a community’s progress, or a nation’s for that matter, is how strongly guiding principles hold the imagination of residents. In a nation bullied by high unemployment, low wages, racial wariness, and serious violent crime, South Africa’s worst drought since 1982 is pushing unexpected virtues into public view. In northern KwaZulu-Natal province, where rivers are barely deeper than shallow streams and wells tap empty aquifers, this small farming town ran out of water in October. Here in the shadows of eucalyptus tree plantations and across a community settled by Germans in the 19th century, the guiding principles of patience, neighborly assistance, and hope for ample rain define how people — black and white — cope through months of hardship caused by dire water scarcity. Some residents who live in town supply themselves with water trucked in from the springs and wells that still flow on their family’s farm spread across the gentle hills and unexpectedly green countryside. Kassie Hinze, a tree and cattle producer, is one of the farmers performing what has become a regular duty. Every two weeks or so he fills a 500-liter (132-gallon) metal tank from his brother’s spring-fed well and carts it into town on the bed of his pickup to keep 2,500-liter (660-gallon) tanks full at his mother’s and sister’s houses in town. Because there is no running water in Paulpietersburg and three other municipalities in KwaZulu-Natal, thousands more people queue up daily in orderly lines with their white buckets and yellow plastic containers to receive water supplied by municipal water tankers. The trucks arrive through the day at street corner depots to pour their cargo into 5,000-liter (1,321-gallon) plastic tanks. Drivers keep a stash of hoses and stopcocks in their cabs because the brass in the fittings lures thieves. Ursula Hinze fills her 2,500-liter tank with water from her son’s farm outside town and from rainwater collected from the roof of her home in Paulpietersburg. “I’m very stingy with my water,” she says. The orderly line culture at the water depots, the regular delivery of water to private tank owners, and the busy Main Street retail trade hydrated by outdoor tanks and rows of indoor buckets has produced a kind of collaborative resignation and only a few instances of public frustration. Not everywhere in South Africa has been so calm. Residents of settlements in the eastern part of the province, unable to secure reliable water deliveries, have taken to blocking roads and lighting smoky tire fires to attract attention to their water-scarce desperation. Water use restrictions are in effect in most of South Africa’s nine provinces. In mining towns in the four other provinces, like this one, that have been declared drought disaster areas by the national government, the contest for fresh water between residents and mine owners is escalating. Yet the steadiness that describes Paulpietersburg’s response to scarcity so dire that water is carried daily on foot in 25-liter (6.6-gallon) containers, often for two kilometers (1.2 miles) or more, is seen by a surprising number of residents here as a window cracking open, a new and important measure of the maturing instinct to get along in a challenged nation. Assuring fresh water supplies appears to be bringing South Africans together. People are coping. They are not fighting. In Mpumalanga province, one resident posted a Facebook page, Water Shortage SA, that has become an organizing and routing tool for delivering water from people that have it to people who need it. In one of the rare instances since the National Government of Unity came to power in free elections in 1994, black and white South Africans are not warily eyeing each other as the cause of a serious impediment to national well-being. Water tanker truck drivers carry extra hoses and stopcocks in their cabs. The brass fittings attract thieves. Every passing week without soaking rain, though, does focus intensifying public expectations on the national government, led since 2009 by President Jacob Zuma and his colleagues in the African National Congress (ANC), the party that liberated South Africa from Apartheid. Zuma and his predecessors have come under criticism for a series of management decisions in community planning, water-related infrastructure investments, water-consuming energy projects, forecasting, and fiscal policy that are aggravating the effects of the drought, and yielding serious consequences for South Africa’s water resources. Linking all of the decisions, even in a nation that is one of the driest on Earth, is the government’s conceit, expressed for a number of years by senior national water managers, that South Africa will never run out of water. The result is that construction of new storage reservoirs has been mostly blocked since 1994 in favor of other government investments. Determined to grow the industrial economy, huge water-thirsty mines and power plants were encouraged in dry regions where the competition for water was already fierce. Government incentives also coaxed millions of people to migrate from rural areas to urban regions, taxing wastewater treatment works that were too small. Without adequate funding for routine maintenance or expansion, supply and treatment works in rural water districts broke down. Water pollution is growing worse in a nation of 55 million people that is adding nearly 1 million new residents annually. Though many of the decisions came prior to 2009, the Zuma government has come under especially sharp criticism. Residents and business leaders say the president and his aides were too slow last year to recognize the mounting threat from the drought, which forecasters say may not end for another year. Existing reservoirs, called “dams” here, are going dry throughout the country. The Bivan Dam, built and managed by the Impala Water Users Association to irrigate 17,000 hectares (42,000 acres) of sugarcane and other crops and supply drinking water to Pongola, holds less than 11 million cubic meters of water, or just 10 percent of its 115 million-cubic-meter capacity. Groundwater levels are so low that aquifers are not recharging. Rainless days are starting to produce serious economic damage in the farm, mining, and recreational tourism sectors. Grain, sugar cane, and vegetable production is diminishing and layoffs are mounting in a nation where 1 of 3 working age adults are unemployed. Food prices are soaring. Residents here say that the persistent dry weather is making the country more vulnerable than it already is to severe social instability. Municipal elections, scheduled for May, are expected to weaken the ANC’s grip on local governments. Filling and hauling water buckets is a daily chore in Paulpietersburg, where the municipal supply went dry in October. Stefan Landman, Head of Department Planning for the Zululand District Municipality, the regional government charged with supplying water to 960,000 residents in and around Paulpietersburg and four more sizable northern KwaZulu-Natal towns, candidly assessed the country’s condition this way: “The moment there’s a drought everybody starts looking to blame somebody. The national government is taking huge flack now. They should have looked at the capacity to store water and build more dams a long time ago. It’s a fact that very few dams have been built since 1994. The drought and its mounting economic turmoil seem almost like a betrayal to the mountainous and incomparably beautiful region of broad vistas, rocky gorges, sugarcane fields and open pastures that surround Paulpietersburg. Dry weather does not discriminate. It challenges the crocodiles that nest in the Pongola River, and the antelopes that drink in shrinking water holes. Cattle perish from lack of feed, and farmers watch stalks of sugar cane, normally deep green, turn yellow. People stand in line and haul water home. Whether the drought moves South Africa’s government to update its water management practices is not assured. The need, though, is plainly apparent. The condition of water supply systems and waste water treatment works in the 14,800 square-kilometer (5,714 square miles) Zululand District Municipality are typical for rural South African water districts. Almost a third of the district’s residents, 300,000 people, have no access in their homes to running water, says Landman. Before the drought, much of Zululand’s water budget was devoted to installing water lines to informal settlements. The design challenge, though, is a lot like patching a worn tire. The Zululand District’s population is growing 3 percent annually. New residents, free under South Africa law and practice to build homes virtually wherever they want, gather in informal settlements with haphazard street patterns. There are 672 informal settlements in the municipalities’ boundary and growing. Moreover, says Landman, when Zululand succeeds in laying pipes and installing the outdoor faucets — called “standpipes” here — that are intended to shrink the distance from a home to a running water supply to no more than 800 meters (half a mile), the taps ignite a torrent of new home building. Capacity very quickly runs short. “Where water is delivered, that settlement grows exponentially in a couple of years because there is water available,” Landman says. Establishing more orderly land use patterns is not a national priority. Wastewater treatment is another zone of frustration. Almost none of the Zululand District’s budget for water services, most of it paid by the national government, is invested in maintaining, modernizing, or expanding the capacity of the district’s 11 overwhelmed wastewater treatment plants. The old plants are a barrier to new development within the boundaries of established towns unless they are upgraded and expanded. In Vryheid, a nearby town, the treatment plant is a serious health hazard. It regularly overflows and discharges raw sewage into the Klipfontein Dam, one of three reservoirs that supply drinking water to that town and neighboring Ulundi, says Landman. The solution, Landman asserts, is a change in national water investment policy, an adjustment he thinks is not imminent. The daily chore to assure an adequate supply of water to thirsty homes occupies everybody’s attention in northern KwaZulu-Natal. The Zululand District has added 50 water trucks to its regular fleet of 11. The cost of delivering water to depots is likely to exceed 60 million rand ($US 3.6 million), more than twice what the district spent on trucking water last year. Paulpietersburg has two active water depots. One supplies water from an old well that was recently brought out of retirement. Wawukile Zwane, a young mini bus driver, was filling 14, 25-liter (6.6-gallon) plastic jugs with the help of a sister and nephew. The Bivan Dam, the reservoir supplying water for farms and towns in northern KwaZulu-Natal province, is 90 percent empty after more than a year of drought. A few blocks away is the big green tank filled by Zululand District water trucks. When the sound of the big trucks is heard in the quiet streets of Paulpietersburg, generally well before noon, people pour out of their homes, buckets and jugs in hand, and, like a big school of brightly dressed fish, head to the street corner depot. Dudu Hoha is a regular at the depot. She chats with friends while waiting for her turn at the stopcock. Typically she spends at least an hour at the depot almost daily. At times she has been late and the big tank runs dry. She has seen no fighting at the tank and only sporadic anger, generally voiced when people try to cut into line. Near the center of town is Ursula Hinze’s home, where her son Kassie arrives to top off the 2,500-liter (660-gallon) tank she installed last fall. She also incorporated a rainwater collection system capable of supplying more water than she anticipated when it does rain. “I use the water very sparingly,” she explains. “I’m very stingy with my water. A full tank should last for three weeks. Twenty days.